June 25 marks the four-year anniversary of Videogram, as the S/T album - rereleased last year as Videogram Redux - made its debut to coincide with Doc Terror's Italian Horror Week. 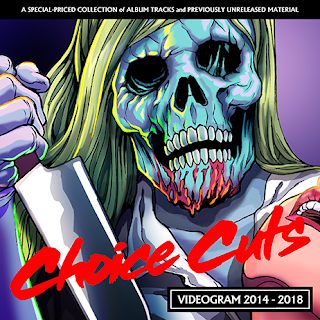 To celebrate this, SelectaVision is releasing the Choice Cuts 2014 - 2018 compilation on CD and digital! The fourteen-track album culls tracks from all official Videogram releases with additional bonus tracks - all remixed and remastered specifically for this release. The album includes a taste from the Videogram and Andrew Claristidge sessions, a demo from the scrapped Slasher EP, outtakes, tracks from the Pre-Cert LP/CD, the Gladiatori dell'Apocalisse and Camp Blood EPs, as well as tracks from omitted releases such as the Cobretti three-track EP. The release date is set to June 25, but pre-orders of both the digital release and CD are available on Bandcamp now. Choice Cuts 2014 - 2018!